Waiting for Rail NTPC 2015-16 call letter? 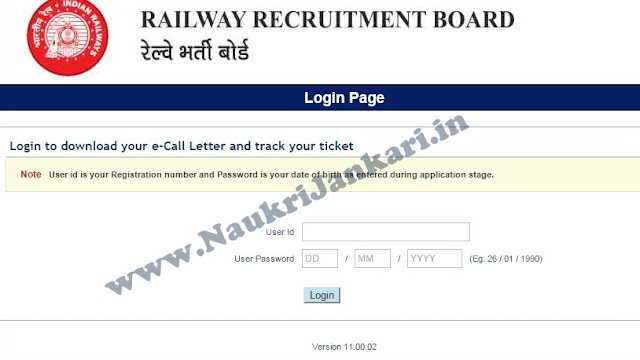 Railway recruitment board has today issued the admit cards for online exam for the recruitment of non-technical posts. The exam will be held on 30th April, 2016 across the country. Download your admit cards for Railway NTPC 2016 online test. How to download call letter for Railway NTPC 2016 online exam? To get your exam's call letter, visit the login page and put User ID and User Password. Your user id is your Registration Number and password is your Date of Birth. Instructions to download admit card is given below (see the image below). After successful login, you will find a box 'Assessment'. Select the assessment. After that you will able to download your admit card. Are you facing problem while downloading? Is there any problem in your exam centre? Many candidates who belong to a state got their exam centres in other states! Railway recruitment board has made a disgusting matter. Are they serious or making some jokes? As per our opinion, there must be a mistake. The board will have to make some serious steps so that exam centres of those candidates are properly set. If you have faced such problem related to exam centres, share your centres here. Update : The download link of call letter went off. It will be again available from 14th March, 2016. Read out detailed news here. 0 comments for " Download Rail NTPC 2016 Admit Card "